Czech Republic born, Internationally known artist Lenka Novakova’s presentation at Definitely Superior Art Gallery comprises of a fully immersive 3 dimensional video installation. River features up to 20 large conical structures fabricated from clear cast glass and mono-filament. 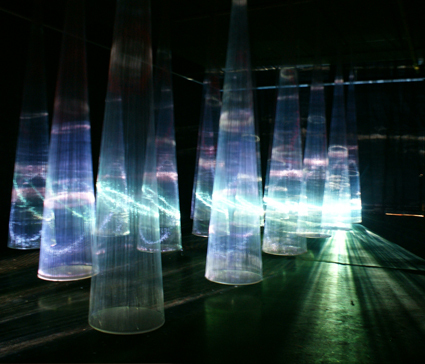 The cones are arranged in a concentric formation through the length of the gallery at which point projected images are discharged through the transparent and opaque materials allowing the image to be simultaneously visible and fleeting. It attempts to transform the entire space into a beautifully sparkling submersive experience of a river current running through. Her practice is concerned with an ephemeral poetic quality, a moment of recreation and re?ective thought through constructed environments, simple technologies and moving light; with crossover in cinema and theatre technologies. Novakova, based in Quebec, received her MFA from Concordia, recipient of Canada Council/Ontario Arts Council and Quebec Council arts grants and has done major residencies throughout the world, she has shown throughout Canada and Internationally. All part of DefSup’s “Urban Infill Art in the Core” projects.